We had enough of that Vetus noise. 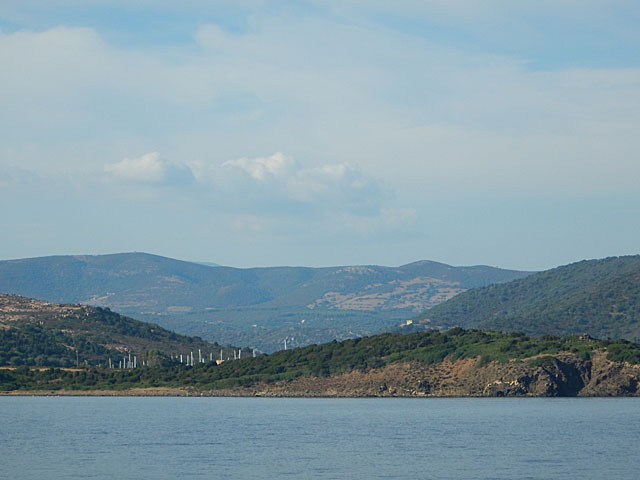 Although the wind was quite light (F2) we sailed most of the way to Porto Teulada. 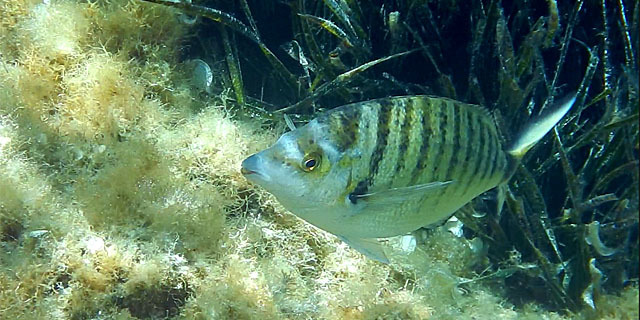 The scenery around south Sardinia is impressive scenery and the water is very clear. 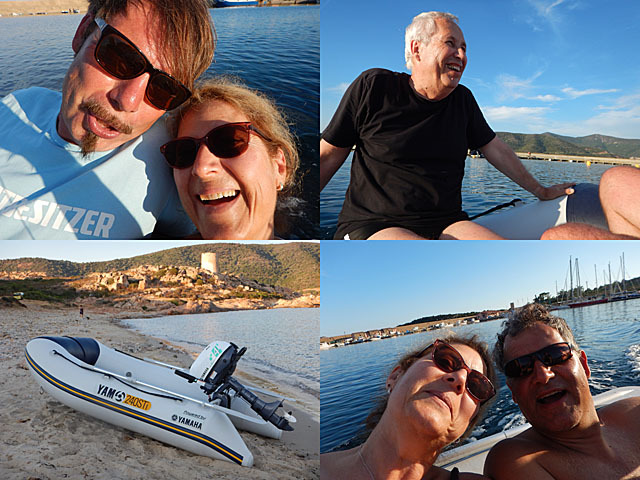 We arrived late afternoon, took the dinghy and sailed to the bay just next to the harbour for a refreshing bath. We are in Italy! 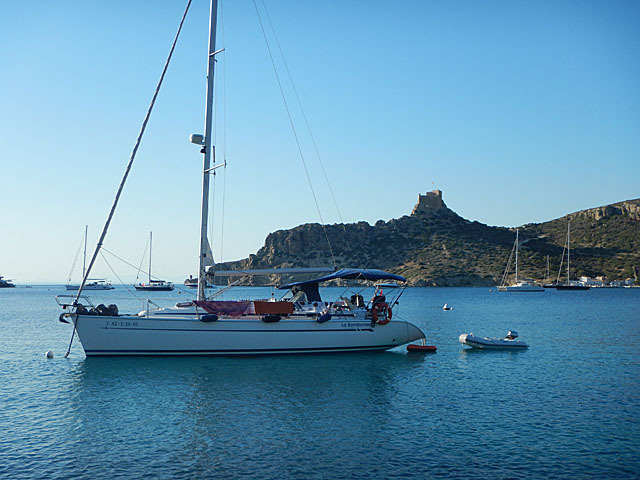 We started in Mahon on Saturday at 6:30 in the morning for the 190 NM trip to Sardinia. 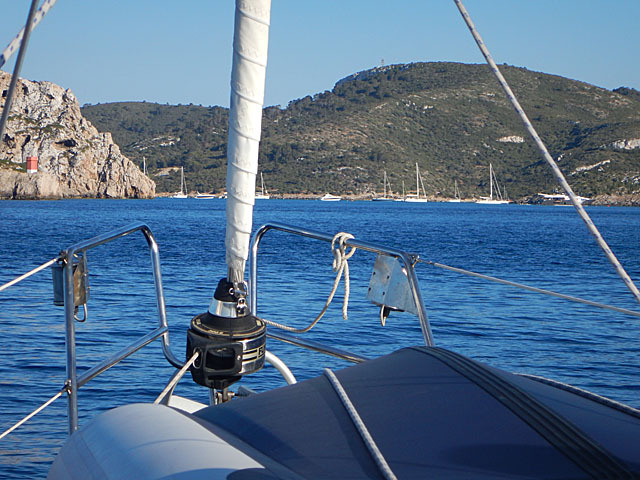 Unfortunately, the wind was blowing at only 5 to 10 knots all the way to Sardinia. We didn’t want the trip to take 3 to 4 days and used the engine (…again). 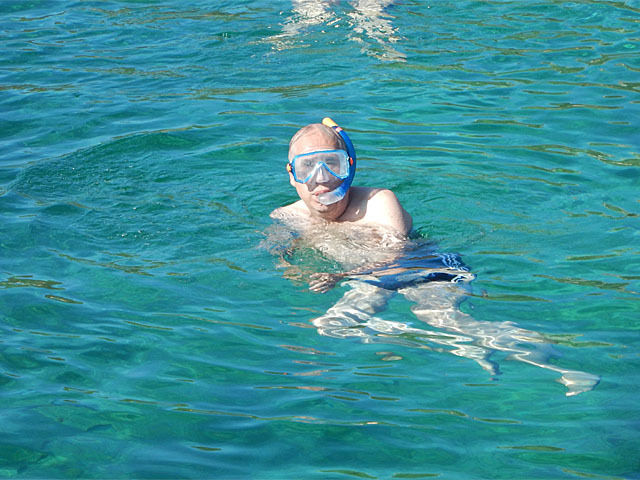 After a one hours stop for swimming in a bay at the southeast end of San Pietro, we arrived today at 17:00 in Carloforte where we moored in the Marine Sifredi. 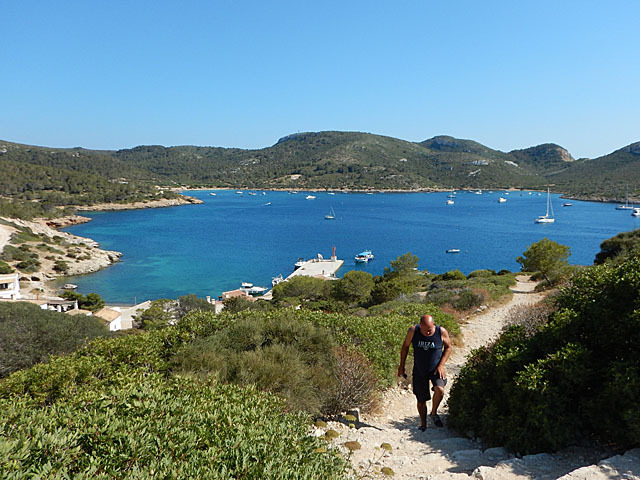 The plan for the next days is Porto Teulada for tomorrow and Villasimius (just 2 miles north of Capo Carbonara) for Tuesday. 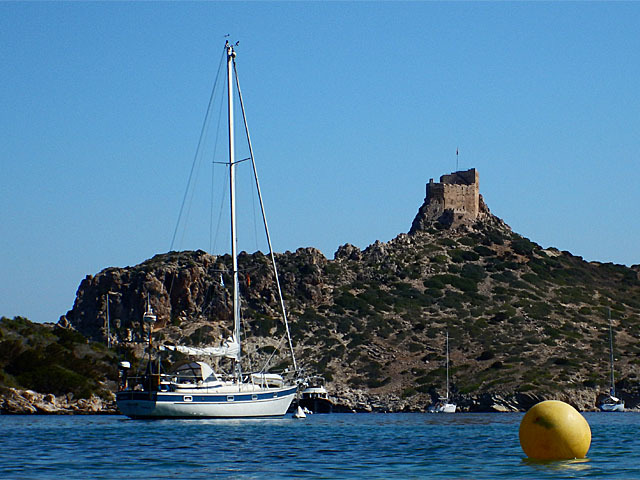 Capo Carbonara is the most southeastern point of Sardinia and a good starting location for the trip to Sicily. Unfortunately, the forecast for the whole next week until Monday the 6th is winds below 10 knots and from variable directions. This applies to the whole area from Sardinia to Sicily. We will have to find a petrol station before the trip to Sicily and fuel up the tanks as the water at the petrol station in Carloforte is not deep enough for Matilda. There is an option to get some fuel in canisters tomorrow morning although not confirmed yet because tomorrow is a bank holiday on the island. 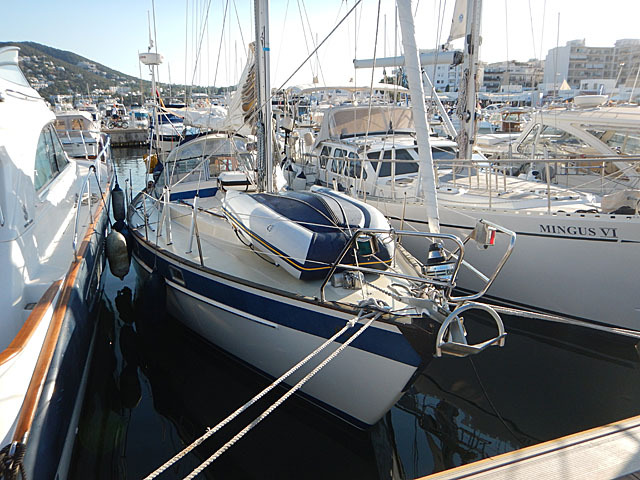 Next entry is probably going to be on Tuesday from Villasimius marina. 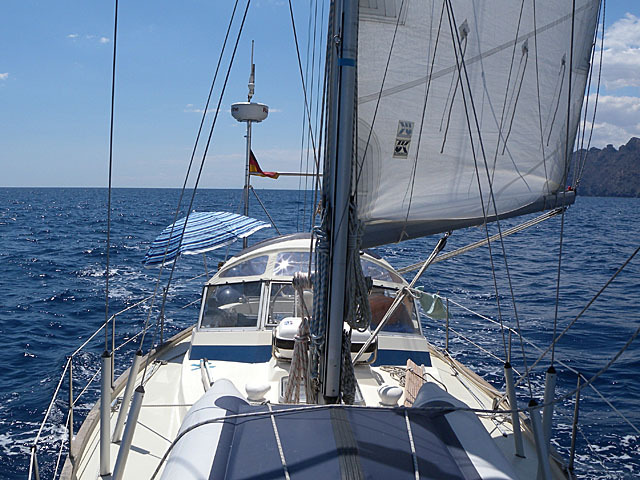 The 55 NM trip from Porto Christo / Mallorca to Mahon / Menorca started with absolutely no wind and a totally smooth sea. We enjoyed breakfast on board whilst under way. Later in the Morning I tried to fit the screw I found on deck the previous day, to the Furlex where it came from. I used some Loctite Threadlocking glue in order to make sure the screw won’t fall off again. After a while I realized that the Furlex had some problems rotating. Finally it wouldn’t turn at all any more. Something was blocking it. 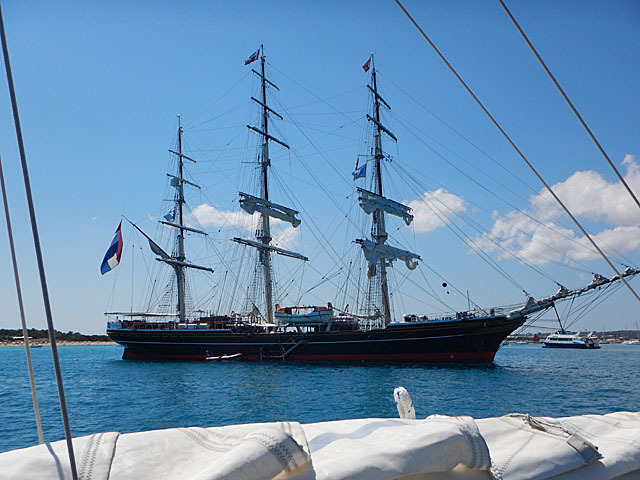 Now where the wind had reached about 15 knots and was coming from the right direction, we couldn’t unfurl the foresail. 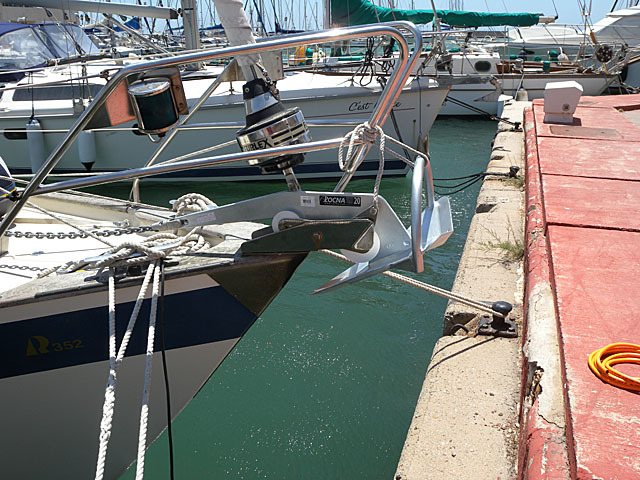 We motored into Mahon Marina and after securing the lines I started taking the Furlex apart and the cause of the problem became obvious. 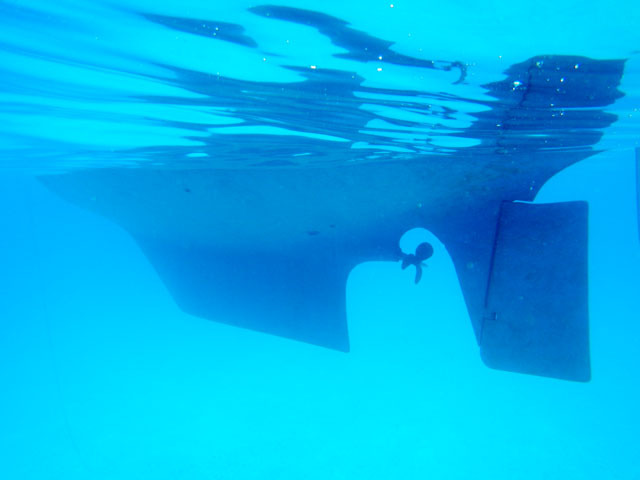 The aluminum profile had fallen too deep into the bow part of the Furlex blocking the mechanism. 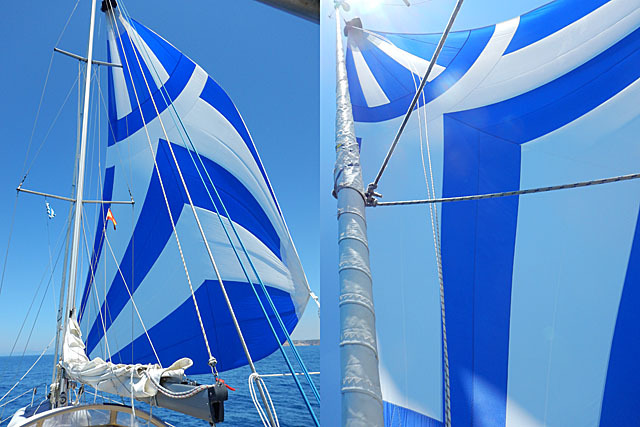 We unfurled the foresail manually by turning it around the forestay and it was possible to lift the profile a bit and properly refit the screws. The Furlex was working again. Tomorrow we planned to start at about 6:00. 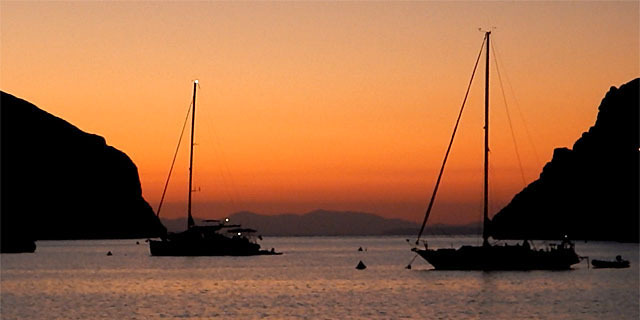 For the longer trip to Sardinia (190 NM) we will sail two days and one night and destination harbour is Carloforte . 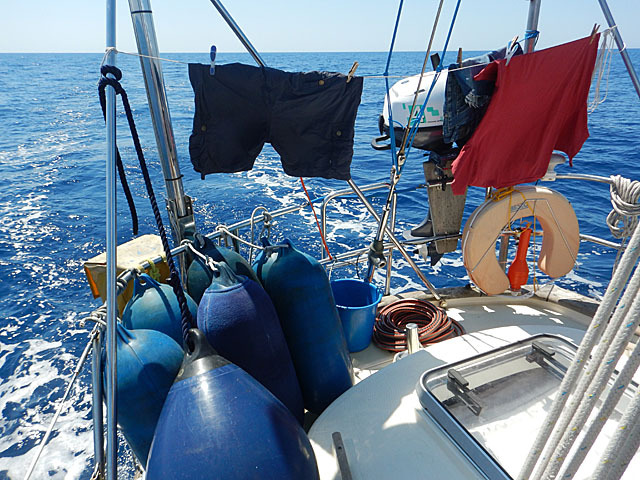 Early crews who joined the northern legs of the voyage had a cold and rainy start; the crew of leg5 started with a nice refreshing bath in Cabrera Archipelago National Park. We left San Antonio de la Playa at about 17:00. We had to motor all the way to Cabrera because the F4 was blowing exactly on our nose. 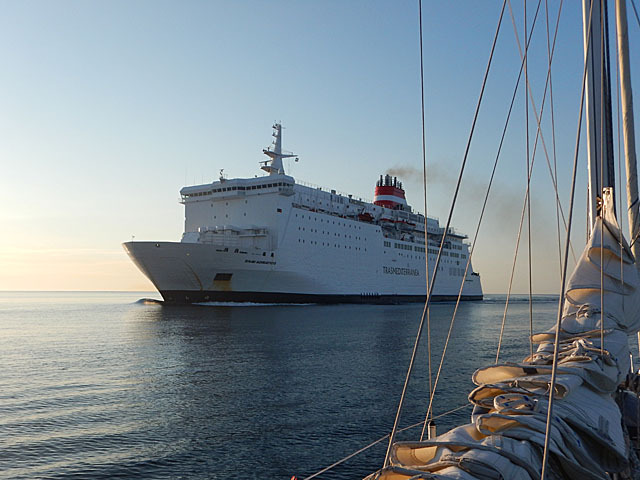 One crew member was seriously suffering from motion sickness. 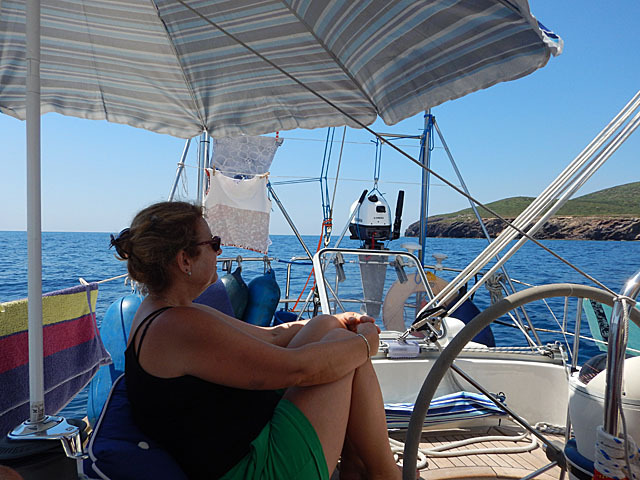 Anyway we thought, if the wind would blow from the same direction, it would perfectly fit for next day where we wanted to sail to Porto Christo which is almost the opposite direction. We left Cabrera at 12:30. 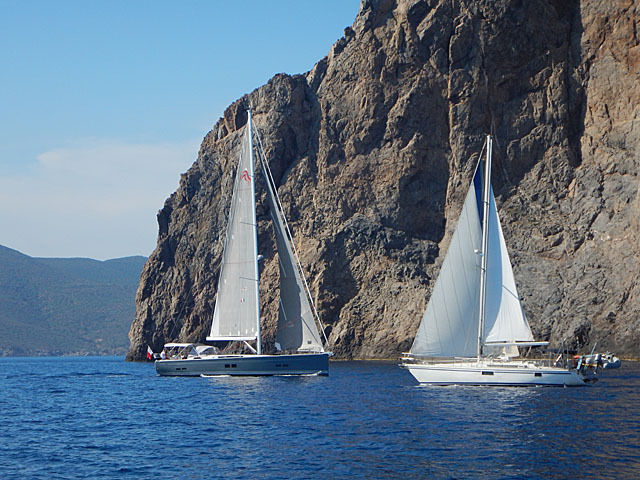 The wind was blowing at 15 to 20 knots on the way, great for sailing but guess what… exactly on our nose again. 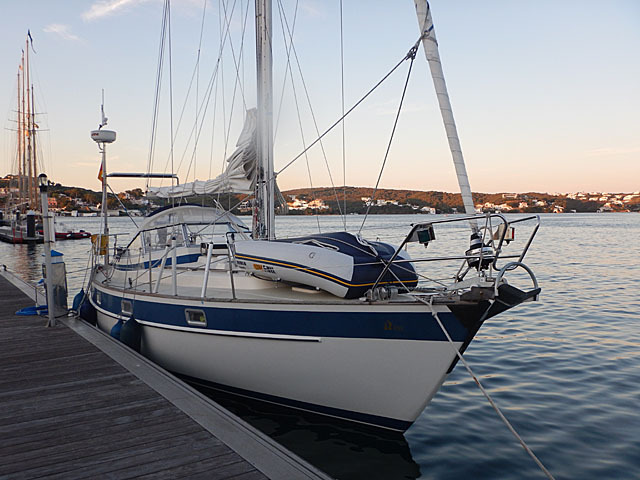 The steep short waves only allowed for 4 to 5 knots speed with the engine running at 2000 revs. 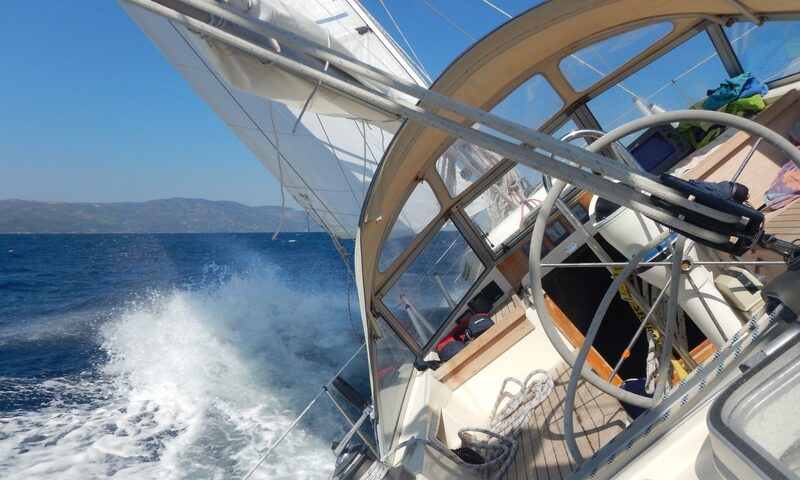 Sometimes speed dropped below 3 knots. 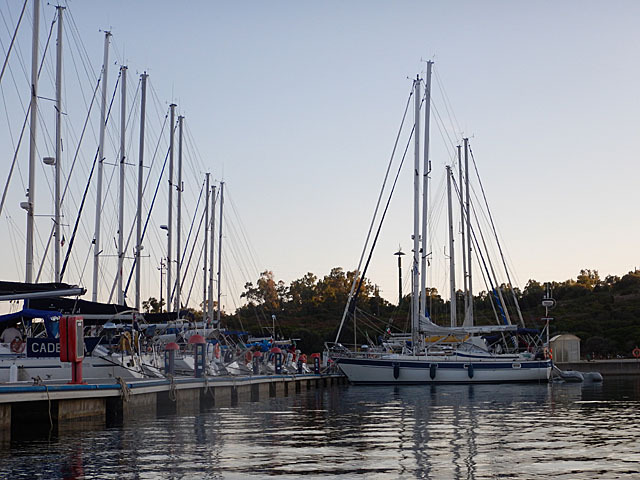 We arrived in Porto Christo at 19:30. 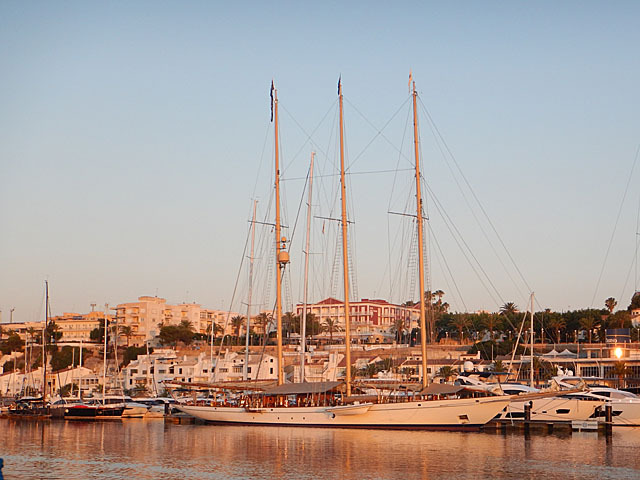 Tomorrows Target is Mahon on Menorca. The internet connection was very bad on Cabrera. Consequently, emails updating and blogging was problematic. Amazing how dependent we are on these media. 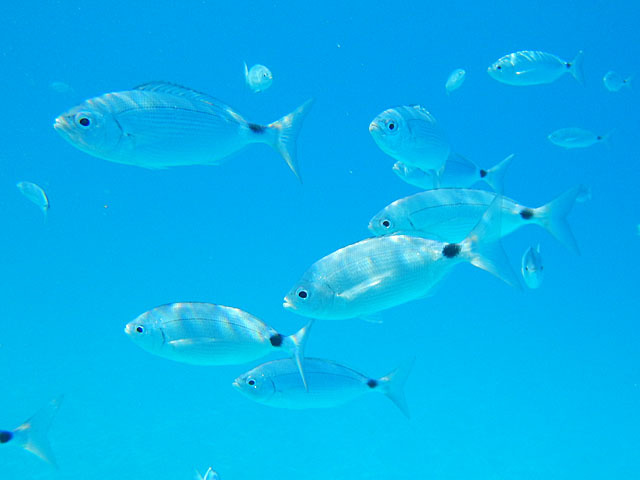 I realized this again when I turned on my PC in the morning in order to check some underwater pictures I had taken. I was getting the error message: “The User Profile Service failed the logon. User profile cannot be loaded”. Great I thought. This is exactly what I need now. How do you solve an issue like this if you don’t have access to the internet in order to check for possible solutions? To cut a long story short, via a quite unstable GSM connection it was possible to connect to the internet and look for a possible solution on the Microsoft page. With Patrick’s help who was so kind to support me on the phone, I managed to log in in safe mode. I modified the registry according to Microsoft’s instructions and everything was ok again. So, reporting and blogging can go on. 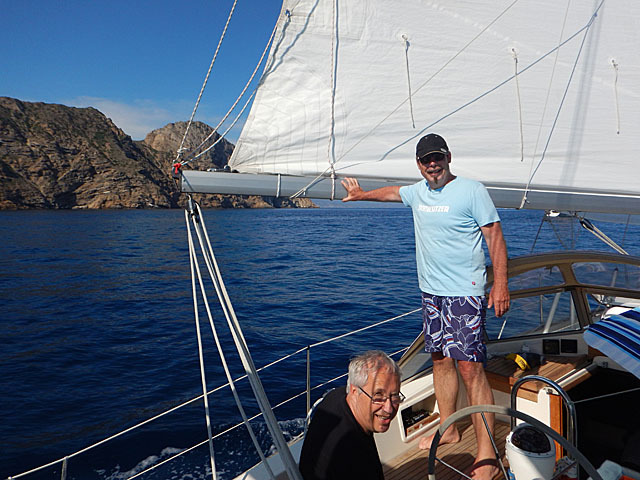 We left Cabrera Archipelago National Park yesterday for Club Maritimo San Antonio De La Playa / Mallorca the final destination of Leg 4. 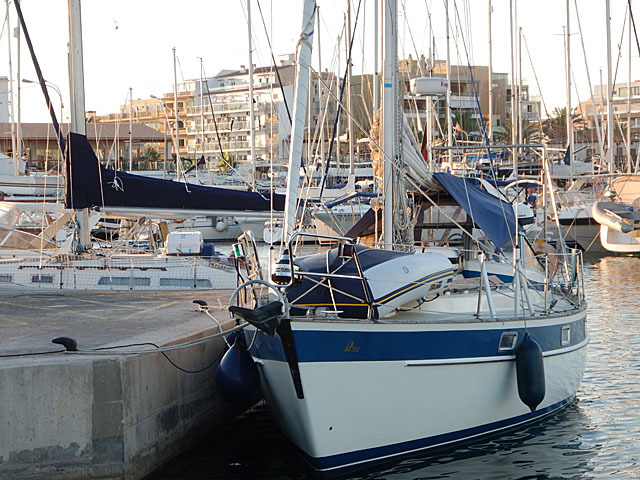 This marina is just 2km away from the airport and thus the ideal location for a crew change. 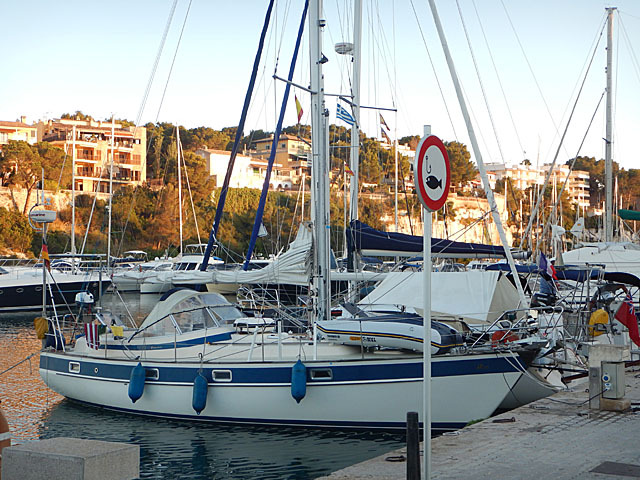 With 60 EUR per night, it is quite expensive, but significantly cheaper compared to Palma de Mallorca. It is also quieter and the “Playa de Palma” is just walking distance away which is nice because the temperature is above 30°C now (not to mention all the beauties on the 3km long beach :) ). 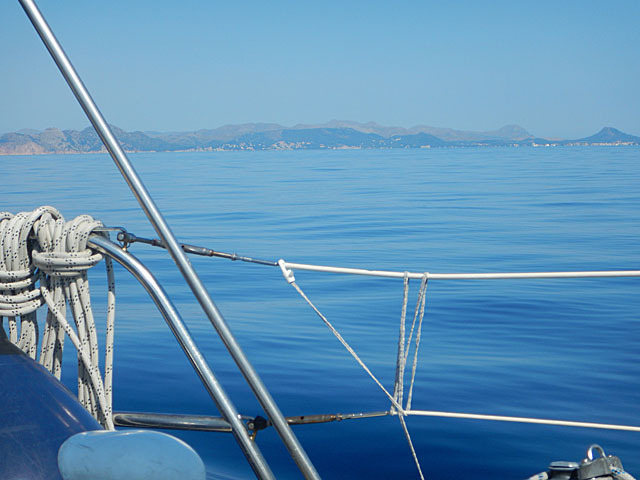 The crew for Leg 5 (Mallorca – Catania) is arriving on Wednesday and the plan is to leave on the same day and sail to Cabrera for the night. 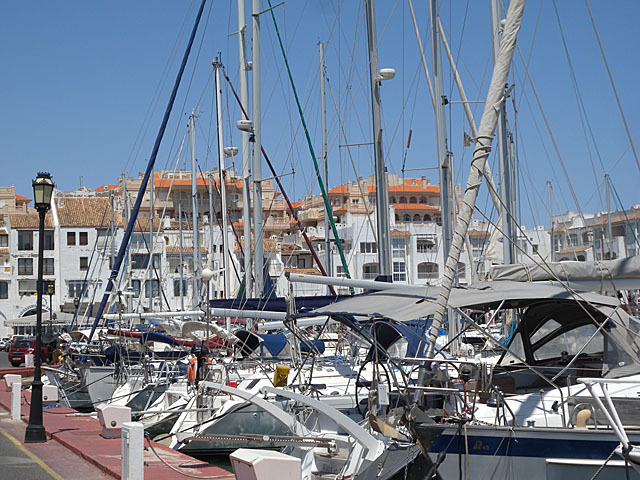 After leaving Cala Sahona Formentera at 11:00 we arrived in Santa Eulalia Tuesday early afternoon. 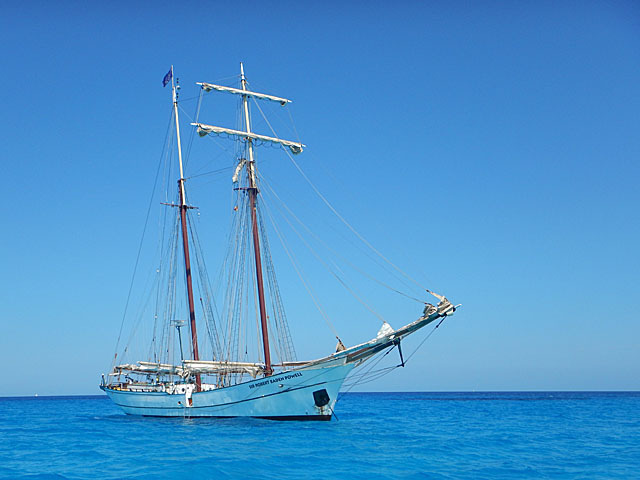 There were many big and expensive yachts at anchor and on the way along the northeast beaches and bays of Formentera. 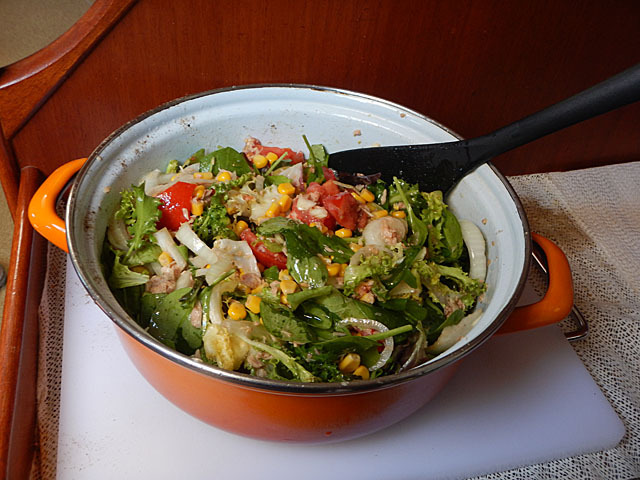 We stayed in Eulalia one night for provisioning. 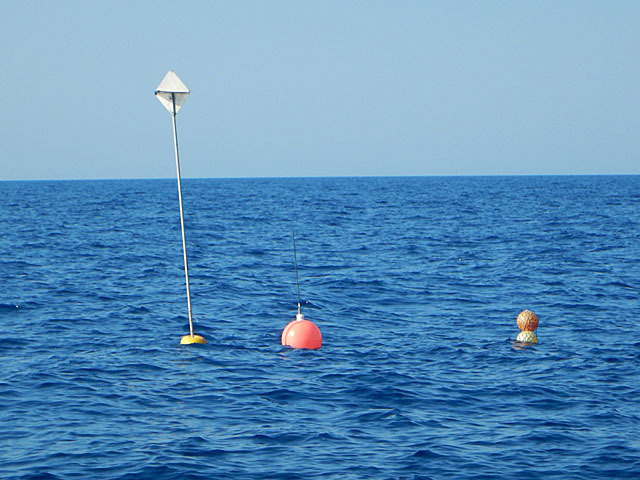 Just one hour ago we arrived in Cabrera and made fast in one of the buoys laid out in the bay. 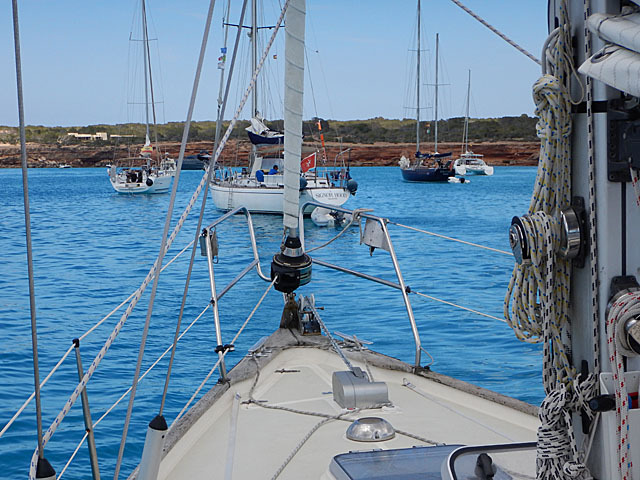 After 8 hours sailing and 18 hours motoring we arrived in Formentera and dropped the anchor in the Cala Sahona bay in between many other boats. A light wind F3 is pushing us to Formentera. We are making 5 knots. Another 120NM to go. Arrival will be tomorrow afternoon. On Sunday morning at 01:00 the wind that was blowing for three days, suddenly dropped to about F3 and we decided to take the chance and move the boat from the tighter inner harbour to a more convenient (maneuver-vise) place at the outer harbour because we were expecting the wind to pick up again to F6-F7 in the morning when we wanted to leave. We started the engine and prepared the lines. I dropped the mooring line, waited a bit for it to fall to the ground, coupled into reverse gear and the boat started to move. A few seconds later the engine died. I had that once before, so I turned it back on but it died again. 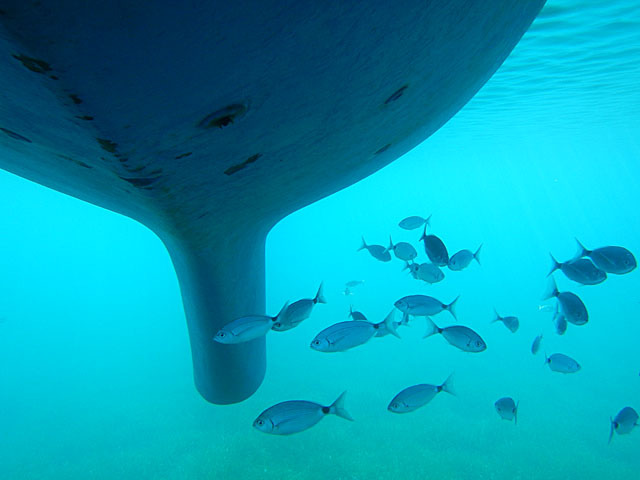 The mooring lazy line was wrapped around the propeller… We were wondering how that could have happened because I had waited long enough for the lazy lines to drop to the bottom before engaging the propeller. 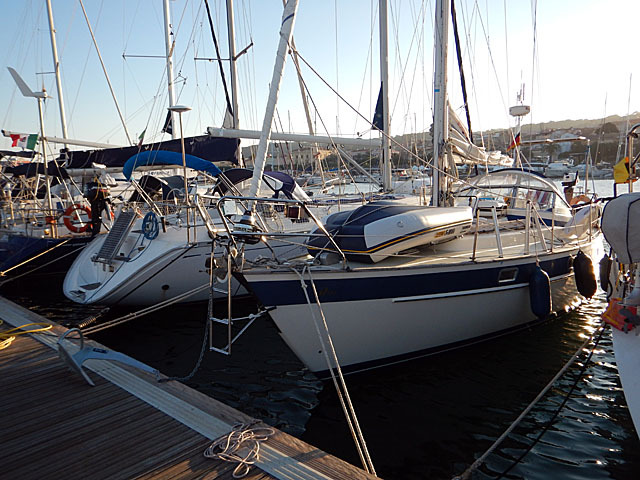 Now, the mooring line was pulling the boat at the propeller. Not really nice. I was able to rotate the shaft manually in the engine room a few turns left and right and then it got free again. 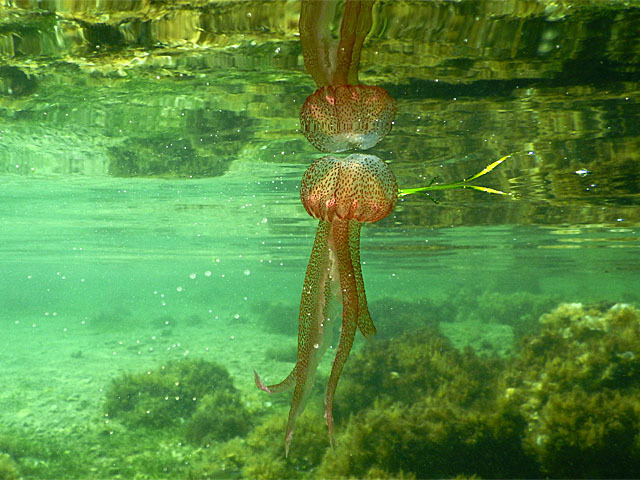 In order to make sure there was nothing left to be wrapped around again, I took a (very) early morning bath in the unclear harbour water (not really recommended) and checked the boat from underneath. 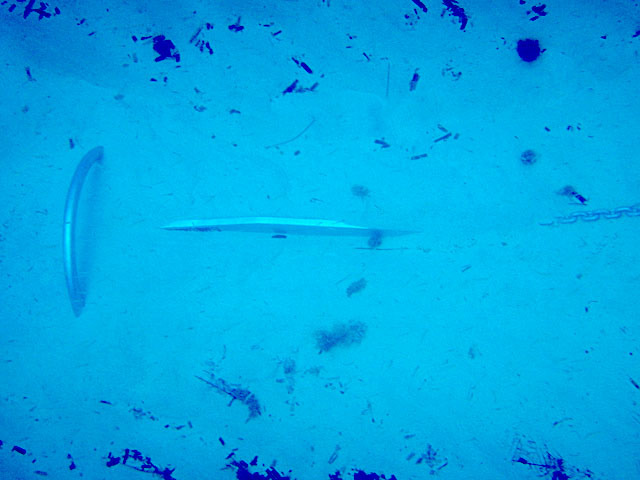 With the help of my “self-made super-duper torch” I could spot a part of the lazy line clamped between rudder and hull and going to the propeller shaft. Now I understood how it happened. 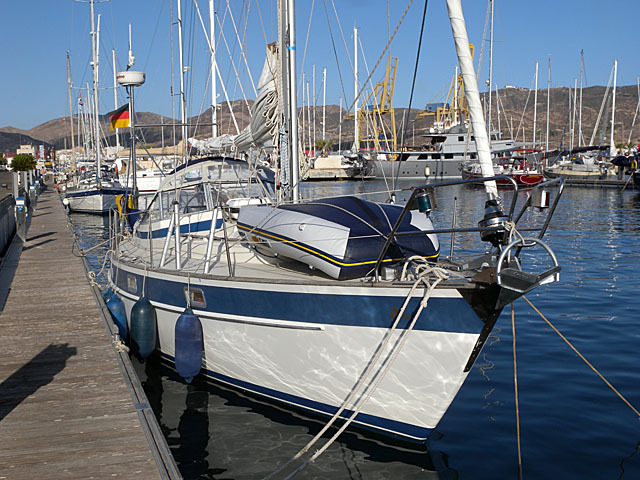 The mooring lazy line came to sit on top of the rudder when we made fast 2 days ago and did not drop to the bottom. Going astern, it wrapped around the propeller. I removed everything and went for a shower in order to get rid of the harbour dirt. We repeated the maneuver and moved the boat. It was 03:00 in the morning and 3 hours left to sleep. The forecasted F6-F7 was not there in the morning and we motored out of the harbour. The wind picked up later and we hoisted the sails. 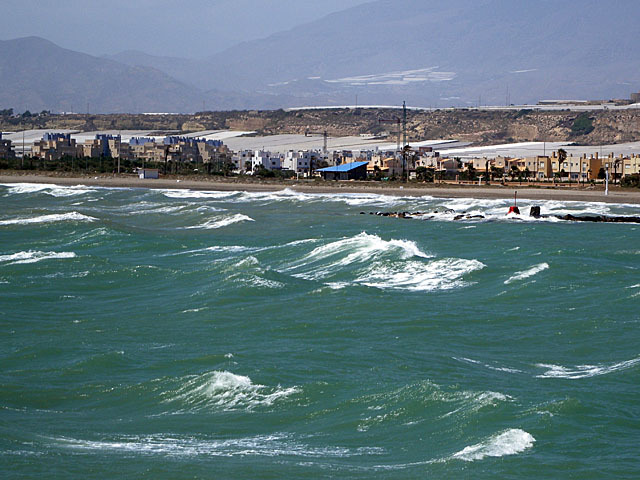 In the last post I wrote “After Cabo de Gata which is about 35NM away, the wind is expected to drop” and that is what it did. 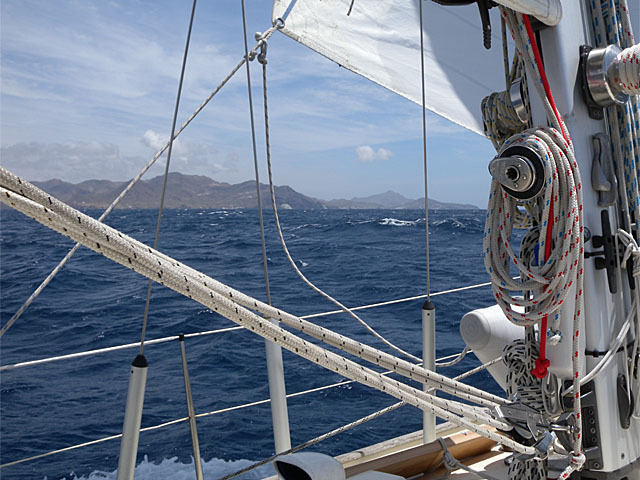 Then suddenly after we had hoisted the full main sail again, it picked up to more than 30 knots (F7). 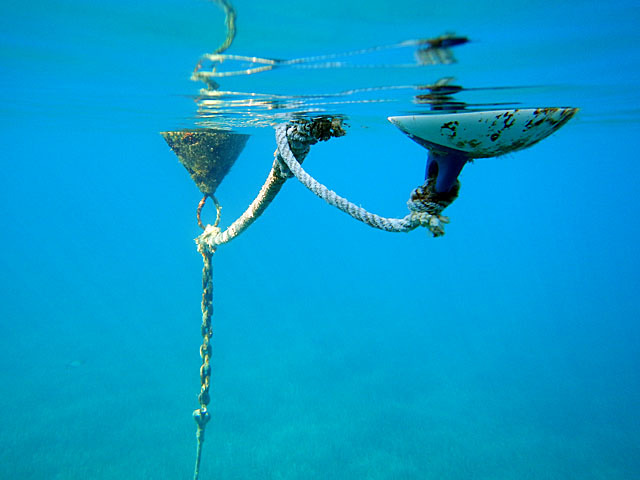 We had to take the 2nd reef in and were still making 7+ knots. 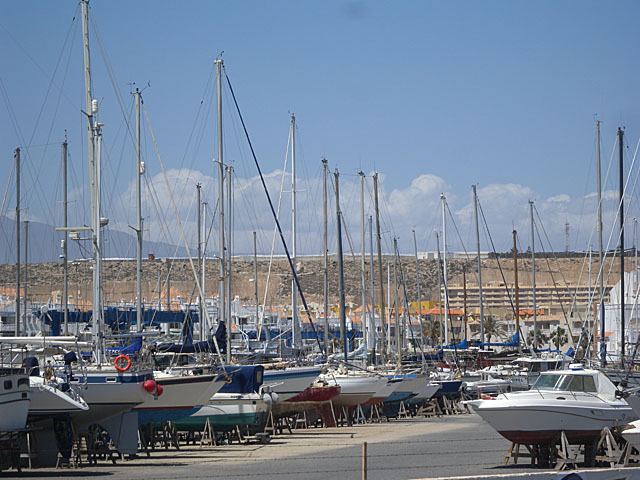 We arrived in Garrucha at about 20:00 meaning no key for the marina gates and toilets but also no marina fees. The repaired tear in the main is perfect and the wind instrument is also still working! 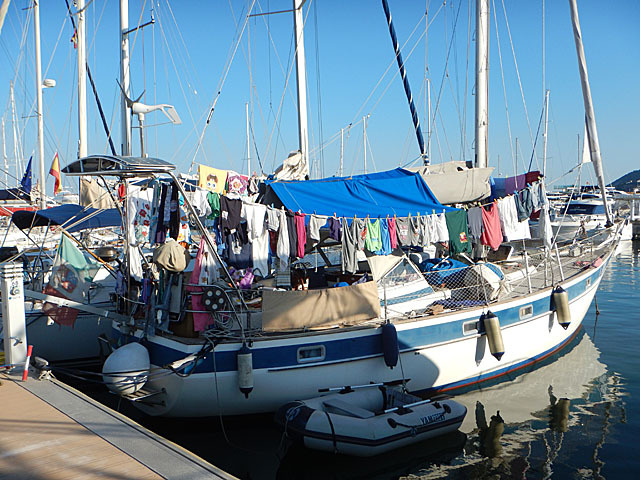 By the way, the Alamar chandlery in Almerimar which is run by some English guys was very professional and friendly. They did everything to get the work done in time and have been very helpful. 5 Stars! 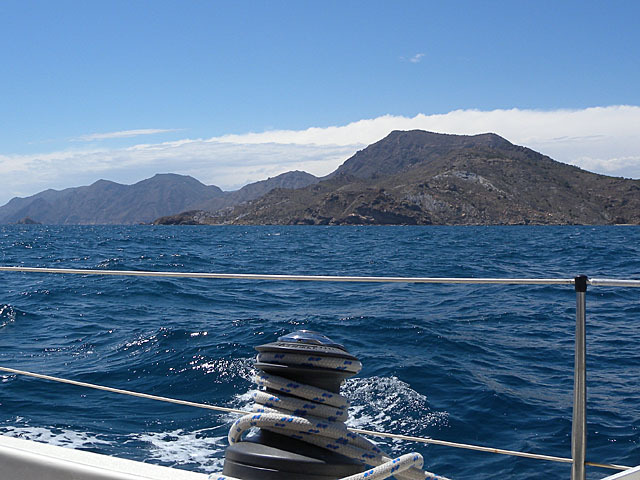 Today we motored all the way to Cartagena because there was no wind and we wanted to arrive earlier for provisioning. 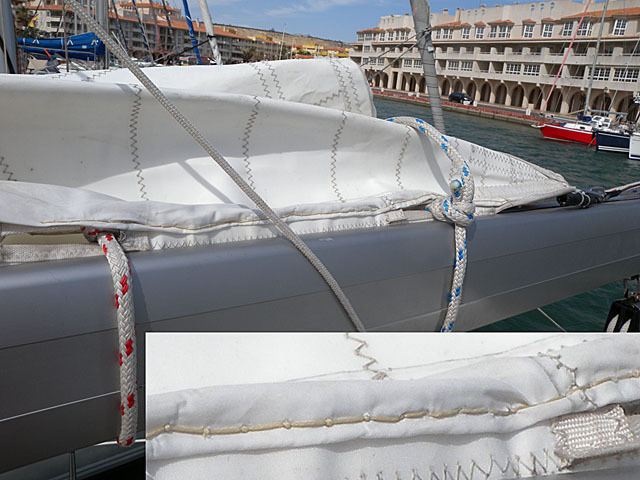 The Wind instrument is repaired (just got the cable with socket and mast top sensor replaced under warranty) and the tear in the sail is sewed (thanks Speedy Stitcher ). I also got a new 20kg Rockna anchor which is supposed to guarantee me peaceful nights at anchor. 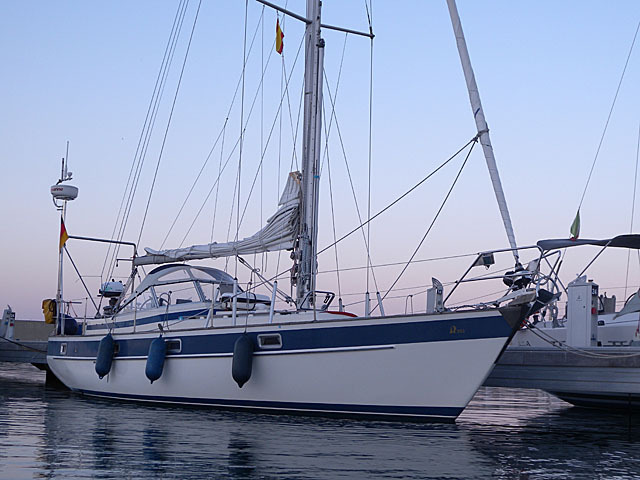 So, as it seems Matilda is ready for the Baleares. Plan is to leave tomorrow in the morning at 06:00. The weather is still unchanged and the forecast is about F5 – F6 SW. That was the forecast for the past days too but it was blowing with F7. Anyway, once out of the harbour (which is going to be quite wet and choppy) we will have the wind from the right direction. 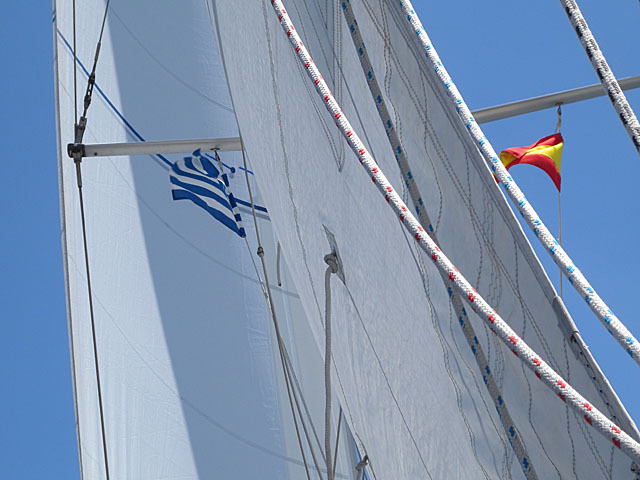 After Cabo da Gata which is about 35NM away, the wind is expected to drop. Next destination is Aguilas.